e-Pulse® Workout Belt can provide relief to common problems associated with sore and aching muscles on the back and waist area. 1. Snap the Jumbo massage pads to the connectors located on the inside of the workout belt. 2. Pull out the wire on the front of the belt and connect to your device. 3. 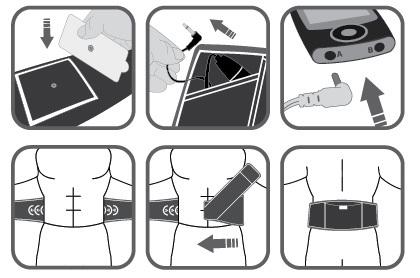 Carefully wrap the e-Pulse® Workout Belt around your torso with the inside of the belt facing your lower back or abs, depending on your therapy preference. Fasten the Velcro ends together. 4. 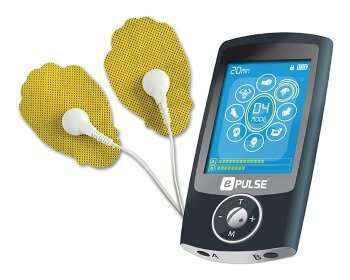 Turn ON your device and press the (M) button to start selecting your therapy. 5. For lower back pain, we recommend a therapy such as SWEDISH and set the duration to 10 minutes. Another great therapy is KNEADING, and the recommended duration of treatment is at least 20 to 30 MINUTES.